Printing Borromean rings in three pieces minimizes support because the first two pieces need no support at all. In this model we've used a hexagonal ring shape with sides beveled so as to allow printing in one assembled piece with no support or raft needed! The "chain" demo file by sal on Thingiverse that comes with the Replicator 2's SD card was the inspiration for this beveled hex design. 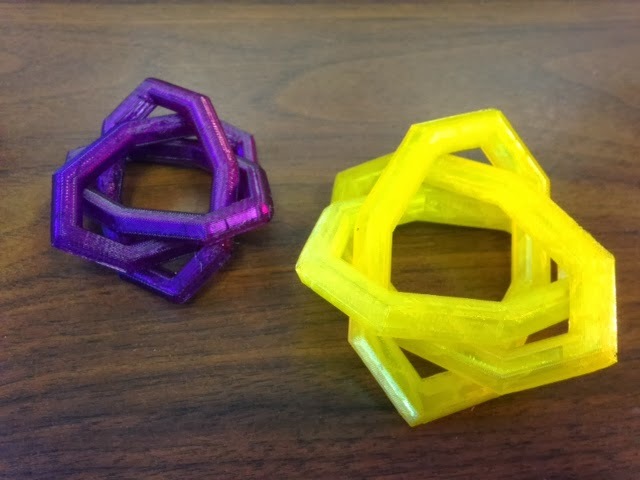 Although not as pretty as the three-color prints, when you need a quick set of Borromean rings you can't beat a print-in-place support-less model. But in case you want to try a three-color model, I've included files for that as well. Settings: MakerWare .3mm/low on a Replicator 2 with no raft and no supports, all in one piece! Technical notes: Like yesterday, use the ellipse function and tubify module from Day 179 and then comment in the part you want to use from the code below.